This book smells of inkjet ink. The paper stock look like they will turn yellow at the sight of sun. You can even see the texture from the photos. The only gripe I have is about the printing. The story itself is pretty simple with wacky characters: Maria, Toby and Jojo. Jojo looks like someone out from Liberty Meadows. 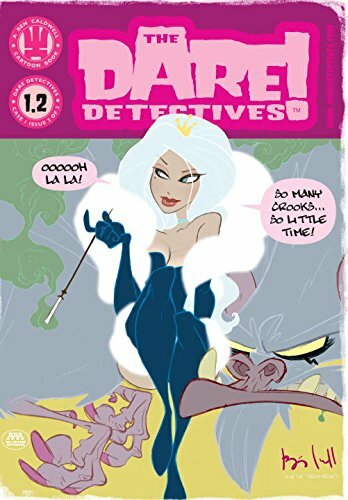 They've tracked femme fatale criminal mastermind Madame Bleu (lady on the cover) and her snowpea-swiping gang of pandas and abominable snowmen to the ruins of the infamous Royale casino, but a traitor threatens to close the case on Dare - permanently! I just like the artistic style of Ben Caldwell. It's very Disney-like, yet not so Disney when the characters are set in a shady scenario. The book reads like a TV cartoon episode. I love Ben Caldwell's work! I love Ben Caldwell's work! After discovering DARE DETECTIVES, I tracked down his other work and even bought his two "how to draw" books. Have you seen his adaptation of DRACULA? It's very nice -- much better quality printing than this one. I don't mind the cheap printing, though, if it keeps costs down. I'm not going to leave the book out in the sun anyway, so what does it matter. The art is simple enough to not demand a high-quality paper.